On April 29 in Real Q1 GDP 0.2% vs. Consensus 1.0%; Disaster in the Details I commented "The second estimate of Q1 GDP comes out on May 29. Any number of changes could send Q1 negative." Here we are already. Imports subtract from GDP and March trade numbers were much worse than expected. The Bloomberg Consensus trade estimate was -42.0 billion. The actual trade deficit was -51.4 billion. The deficit was outside the entire range of estimates of -45.0 billion to -37.8 billion. First-quarter GDP, barely above zero at plus 0.2 percent, may move into the negative column on revision following a much higher-than-expected March trade deficit of $51.4 billion, the largest since October 2008. The unwinding of the port strike on the West Coast, which was resolved mid-month March, played a major role in the data especially evident in imports which surged $17.1 billion in the month as backlogs at the ports were cleared. Imports of consumer goods, especially cell phones, were especially heavy. Exports, led by aircraft, also rose but only $1.6 billion. The total goods gap in the month was $70.6 billion which is the highest since August 2008. The gap in petroleum trade, at $7.7 billion vs February's $8.2 billion, wasn't a major factor in the March data as the drop in prices was offset by a rise in volumes. By country, the gap with China widened to $31.2 vs $22.5 billion in February and to $7.1 billion vs $4.2 billion for Japan. The OPEC gap widened slightly to $1.2 billion vs $0.7 billion. Today's report offers stark evidence of how much the port strike really did impact the economy and was likely one of the major "transitory" factors, as the Fed puts it, that slowed down first-quarter growth. These effects are likely to unwind in the second quarter and become a footnote for first-quarter data. Economists still cling to the notion this is transitory. For my take, please see Fed Cites Weather, "Transitory" Factors in FOMC Statement; No Hat Tricks; What About Consumer Sentiment? In light of the today's trade report the Atlanta Fed lowered its GDPNow Estimate for second quarter GDP to 0.8%. Note how economists still cling to optimism no matter how bad the economic numbers. If the Atlanta Fed still modeled 1st quarter, I would now expect it to be negative. On April 17, I commented Déjà Vu Weather? No, It's a Recession! 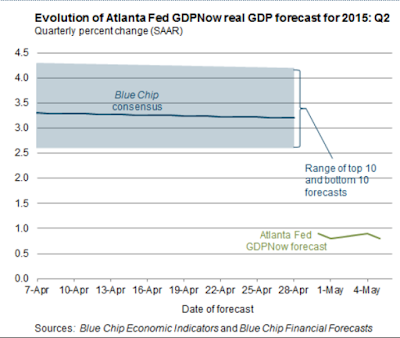 There's no need to change that forecast no matter what fantasies the blue-chip economists have for 3.5% growth.